Hi Vash Stampida and welcome to the forums ^.^ ! 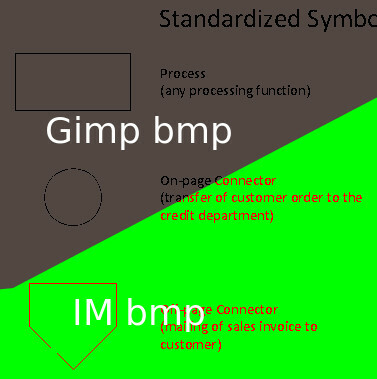 .BMP is a bandwith hog especially for large images. Bitmap is also an older format. A 2 colour indexed bmp shows with black lines on a dark gray background, so something is not correct with the way FF renders a bmp. Export as a .gif file. and it is about a third the size of the bmp. (Sep 13, 2014 23:43)ofnuts Wrote: Hmm. The PNG format is better than GIF for all uses except animations. You are, as ever, correct. A bright green/red this time. In Opera (v12) browser both are bright green., so not only FF. Completely different subject, what is the 'barcode' Barcode readers do not recognise. or is a grayscale medal ribbon from your flying exploits.